Release dates: The last day of each month. Manuscripts: The Journal seeks original manuscripts reporting scholarly work on the Humanities and Social Sciences. Original articles may be empirical and qualitative studies, review articles, methodological articles, brief reports, case studies and letters to the Editor. Language: The manuscripts are required to be written in English or French. 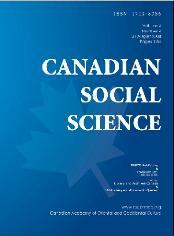 The Canadian Social Science (ISSN 1712-8056 [Print] ISSN 1923-6697 [Online]) is an English and French language journal published by the Canadian Academy of Oriental and Occidental Culture. It is published on a Bimonthly basis since 2005. It covers a wide range of dicinplines in Humanities and Social Sciences. Canadian Social Science is filed by Library and Archives Canada, and collected by the database AMICUS of Canada, indexed by ProQuest LIC.,. Gale, EBSCO Publishing, Ulrich's of America, .indexed by DOAJ of Sweden, indexed by CNKI of China, indexed by Open Access of Germany, etc..
1. The manuscripts are required to be written in English, and they should be submitted to css@cscanada.net or css@cscanada.org. The preferred format is MSWord. 5. The copyright of the articles goes to the authors, while CSS owns the first publishing right.